Take a ride in the lap of luxury in our brand new - custom built - 25 passenger - Execu Lounge bus. The interior is perfect for any occasion. Comfortably seating 25 people, this bus offers a full 8 feet of headroom, hardwood floors, Bentley-stitched leather seating, and a hand crafted fiberglass bar with two separate cooler compartments. There are two tables in this bus, perfect for laptop workstations or putting out snacks. The front of the bus also has a unique semi-dome shaped window on top - which makes for an incredible, nearly panoramic view of the outside. For entertainment, the 1,500 watt stereo system has  12” sub-woofers for some banging music, and there are a total of 5 flat screen televisions, so rest assured everyone sitting on the bus will be able to kick back and enjoy a TV from any angle. Using Bluetooth, you can wirelessly stream your smartphone’s audio to the 1,500 watt sound system. DIRECTV on a bus? - You got it! When you’re on this bus you can watch your favorite shows and enjoy any of the premium entertainment channels (HBO®, STARZ®, SHOWTIME®, and Cinemax®) for absolutely no extra charge. (Please note: Television service relies on the ability of the motorized satellite to acquire a signal which may be affected by weather conditions, tall buildings, and possibly other factors.) The spacious rear luggage compartment and overhead storage also make this bus a perfect option for airport transportation or any other groups having luggage. Long distance - nights on the town - weddings - sporting events - tailgating - this bus can do it all! 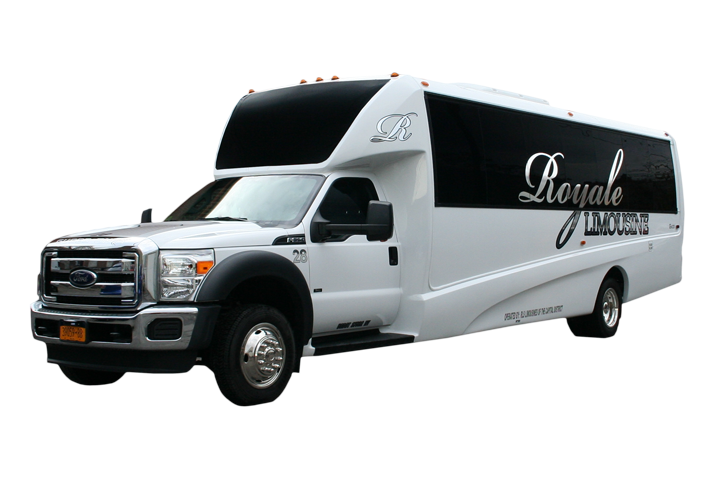 Contact Advantage Limousine and reserve the 25 Passenger Execu Lounge Bus today!